I have just been and checked the ASOE web site and was delighted to find that my Valentine exchange for Maggee in the USA has been delivered – very good considering I posted it on the 29th Jan. The pattern was an old one that I have had in my pattern collection since the late 1990s from a cross stitch mag and was originally designed as an Xmas ornie in red and green. 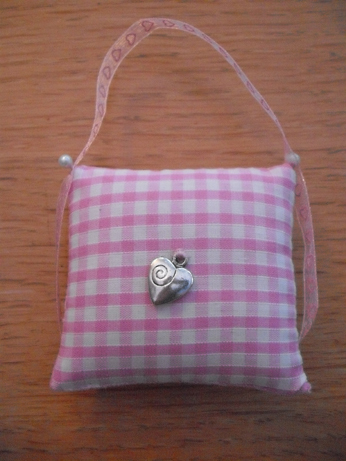 One of my usual little charms on the back - love this gingham - reminds me of primary school summer dresses! 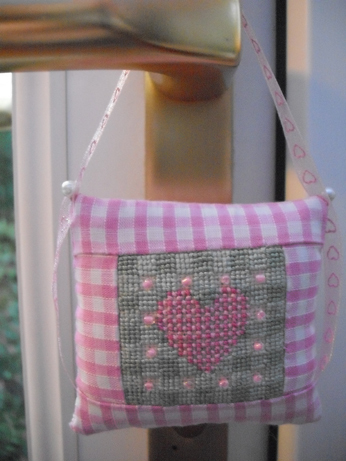 Maggee really likes pink so I decided to stitch it in pink and green and try out a new finish with this little bordered cushion with the pink gingham. The little charm was from my stash – not certain where I got it from – may have been my LNS some time ago. It was very simple to finish and generally quite a good stitch – not very quick as there is a lot of evenweave to be covered with the check background and it is very tiny! However I interspersed this project with knitting to give my old eyes a rest! I am pleased that Maggee likes it and eagerly await getting my ornie from her. That is really pretty and because it isn’t in the obligitory red can stay out all year. Good thinking!